"Sweet and spicy; and the juice makes an excellent marinade for pickled eggs. 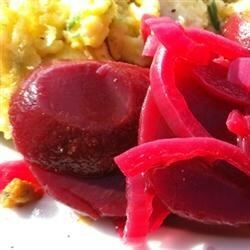 This recipe is great with freshly cooked beets instead of canned, if you have time." I used this recipe to can over half the beets in my garden. I think the pickling mixture is perfect and wouldn't change a thing! Soooooo easy! I think I did this in under 10 minutes. BTW - 2 1/2 cups is 2 14.5 oz cans worth of sliced beets. This is an excellent recipe for beet lovers. I added a cinnamon stick to the recipe. I also add hard boiled eggs along with the beets and onions. Really easy and great tasting. I ate a whole bowl like it was candy.